Bay and bow windows are two styles that’ll increase your home’s curb appeal as well as the appearance inside. They’re big, beautiful combinations of different styles of windows that extend past your home’s exterior. While they both extend beyond your home’s facade, bow and bow windows aren’t exactly the same thing. A bay window consists of 3 windows – a large picture window flanked by either casement or double hung windows on each side. Bow windows are a little different. They can feature any combination of 3-5 picture, double hung and casement windows. Bow windows get their name from the “bowed” shape they create. As you might assume, bay and bow windows offer the greatest amount of natural light for your home compared to other window styles. They take up a lot of space and in return, provide amazing views as well as ample fresh air for your home. Since bay and bow windows are made using double hung and casement windows, you will be able to let in any amount of fresh air that you want. Bow and bay windows will greatly increase your home’s curb appeal and interior design. They extend beyond your home’s exterior and add depth and dimension to your home. On the interior, bow and bay windows create a window seat. You can choose to make it an extra seating area for guests, a place for plants and decorations or whatever else you see fit for your home. They will also make whatever room they’re in look bigger because they extend outward from your home. 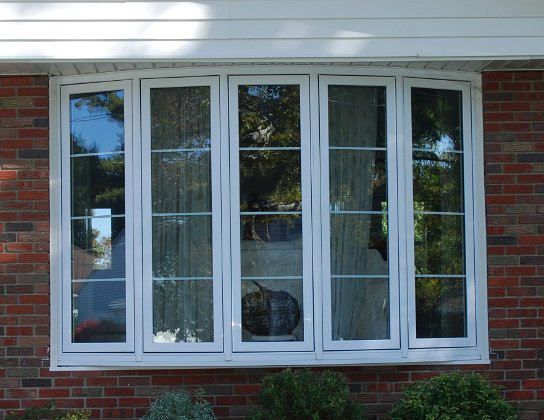 Since these windows are large and take up a good portion of your home, it’s important that they’re energy efficient. When you choose Feldco, you’ll have the assurance of knowing your windows are made of premium materials and constructed for Milwaukee homes. The glass panes will be filled with argon gas and the frames will be foam insulated for maximum energy efficiency. Plus, Feldco windows are installed by certified professionals, so you’ll know that your windows will be installed snug and secure. Where Do Bow and Bay Windows Work Best? Since bow and bay windows are large, they’re usually found in living rooms and family rooms. However, if you have the space, they can look great anywhere in the home such as bedrooms or game rooms.